What is your Passion & Purpose? This is an exploratory workshop of meditation, desire, writing, and creating a blue print of who you are, why you are here and what you are going to do about it! If you already know your purpose in life – that’s wonderful! This workshop will enhance that vision and open you up to new ideas or reinforce that you are still on the path you want to be on! If you are not sure and still asking yourself “Why am I here?” This workshop will support you in dreaming big, shooting for the Moon and not settling when it comes to identifying what drives your joy and using that to serve yourself, humanity and the highest good of all beings everywhere! I have been reunited with my massage table and all my tools! 10 Class Passes & Gift Certificates now available! The 10 Class Pass is only $75! That's only $7.50 per class and that's not all! The pass can also be shared, so buy a pass, and bring a friend! I suggest you call me at 289-926-9108 to register for the class you want, so your spot is guaranteed when you arrive. Gift Certificates​ are also available in any denomination. The Sun wasn't up yet, the curtains were drawn, candles were lit, the fire was crackling in the wood stove and the music began. I swayed, stretched, did Tai Chi and danced to beautiful music from around the world. My body gently awoke and my heart rejoiced as I moved in my own way to music from Africa, Canada, Peru. Lyrics in many different languages allowed me to move and dance without thoughts or images coming to mind - lyrics in Hebrew, Spanish, Ethiopian and Icelandic. I swayed to different styles of music from electric violin, to global fusion, to Cumbia to 60's surf guitar! Come out to a Sacred Dance at Tusket House, Tuesday mornings at 7:30 and Wednesday evenings at 7:00 for a wonderful experience of allowing your body to move how it wants to move! 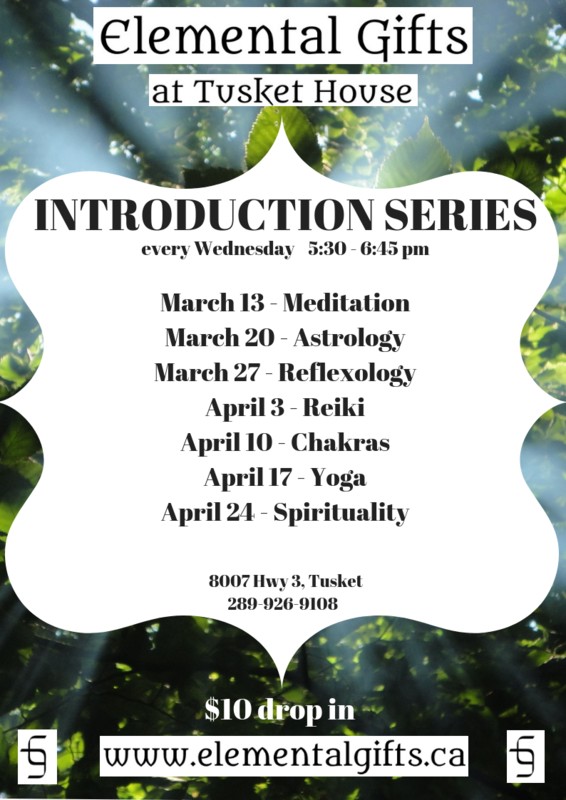 Each Wednesday from 5:30 - 6:45 pm is the Introduction Series - a seminar addressing a different theme each week, to give you a taste of some of the things I offer. Every other Saturday there are workshops that go in depth on some of the tools I use and practices I do - and most have a take away 'Gift'. 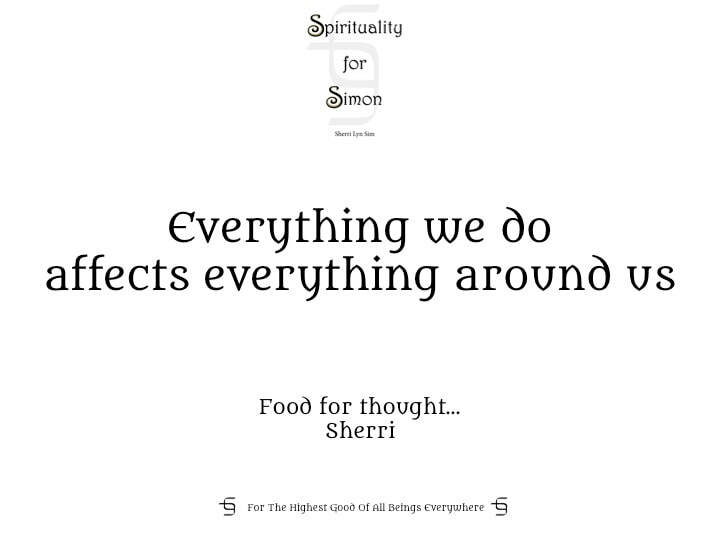 All these events bring joy to my heart, to do and to offer, but none more than teaching Reiki, my passion and purpose. I look forward to this wonderful project and opportunity! I woke up this morning in Nova Scotia with the sun shining in my window and not a cloud in the sky! Oh Happy Day! And so too tomorrow - and every Saturday from 9 - 1 pm! ​I'll be at the Yarmouth Farmer's Community Market! Drop by and say hello and see the new line of Meditation and Chakra Beads I have created! Sacred Dance is an individual expression in dance/free movement. You may dance, sway, sit, meditate, contemplate, rock, writhe – whatever it is your body wants to do. Here we listen to our bodies and let the body move how it wants to. There is no choreography, no steps, and it’s not guided. It’s free movement. The music is carefully chosen to take us through a gentle start, build to a climax and wane back to a gentle finish. It incorporates music from around the world, some instrumental and some in different languages, to let you lose your self and find yourself all at the same time. You get to choose your level of participation. You are in a sacred space where you are free from judgment, from yourself or others, free from competition - you will be in your own world. Dance like no one is watching because in Sacred Dance, no one IS watching. It’s a place to let go and be free. Meditation is a practice of focusing the mind to achieve a mentally clear or emotionally calm state. It helps both physically and mentally. It reduces stress. Reduced stress allows for your body to move out of a fight or flight state into a rest and repair state. In this calm state, your breathing will deepen, allowing for relaxation, where circulation improves as the tension subsides. Your memory will improve, ideas, answers and insights come, your will be more attentive, have a better attention span, and be more perceptive. Yin Yoga allows for the gentle flexing of the connective tissues, the tendons and ligaments. Through supported relaxation, these deep places in the body get to open up, without stress or strain to them. Yin is a gentle, compassionate form of Yoga, about acceptance of one’s self, one’s body and one’s abilities. This is the lovely house I am calling 'Home' :-) and it is the home of Elemental Gifts as well! I can't easily express how excited I am to offer therapies, classes, workshops and trainings here! and here in Tusket, Nova Scotia, Canada was a hit! To map out your year ahead, you will get a 2019 calendar and manual, in PDF format, that include major astrological and astronomical events, meteor showers, eclipses, lunar cycles, retrogrades, equinoxes, solstices, sabbats, visible planets and portal days! ​ The girls love their creations of gratitude!